…and I’m sorry that I sounded so negative in the last post – sometimes what I think is going to come off as ‘funny’ just…well, doesn’t. 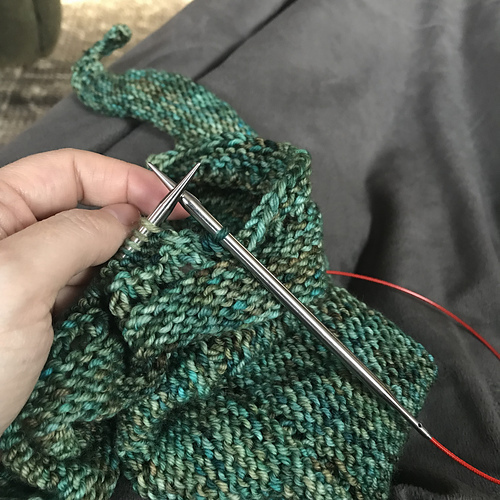 I did manage to put a ton of stuff on my Zen, and when I walked away from the computer issues I was having I did a little knitting while listening to The Historian. My current status on my Festivus stocking is over yonder <— I’m enjoying this a lot – it’s the stocking in the Holiday 2006 issue of Interweave. 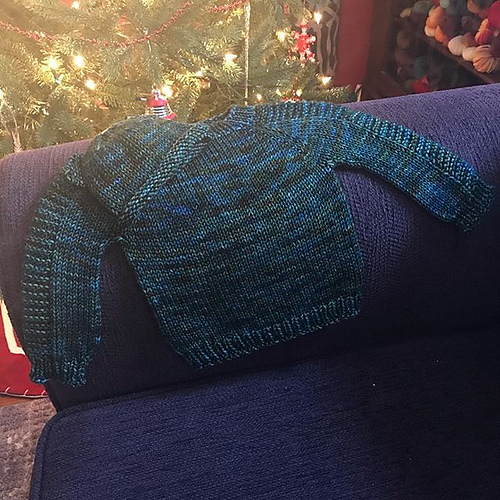 I changed it just a bit – I’m not using the Jamieson’s Shetland called for in the pattern, I’m using Cascade 220, and I’m not using the size 2 (!) needles, either. I’m using 4’s and 3’s (it’s still a maybe on the 3’s, I’ll let you know…) this makes the gauge just a tad bigger so I cut out one repeat of the pattern so it’s not gargantuan. Even with the repeat removed, RR is still looking kinda nervous at the size of this thing. I did tell him that he didn’t need to fill it…and I meant it – I’m happy with what I already have. The other big happening today is…Christmas landed at chez ‘Lu in a big way. We went and picked out our tree (yay!) and got it up (yay!) put lights on it (yay! yay!) AND nobody got hurt. Including the tree – and the house ;o) Although, in this picture it kinda looks like RR got eaten by the thing, doesn’t it? Wanna see a lit picture (of the tree…)?